Abba Patio Outdoor Swing constructed with durable metal frame and comfortable cushioned seating; Universal design and a variety of sizes and styles provide more choice for you. It's a perfect unit for your backyard relaxation, increasing joy of your leisure time with friends and family. Steel frame construction with weather-resistant finish ensures lasting use, for sturdy strength and durability. Durable steel arms bar can support up to 400 pounds and seat 2 people. This porch swing has three removable cushions and one pillow offer you comfortable seating for relaxing in the yard or on porch. Just enjoy the beautiful weather with your friends and family. This swing brings a blend of functionality and beauty to your patio or deck. 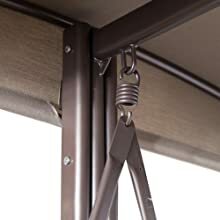 The canopy has an adjustable-tilt function that allows you to position as needed to block the sun. 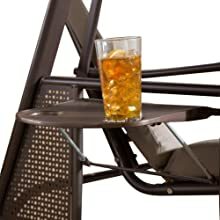 2 attached side tables provide a convenient place to set drinks or put readings. The teapoy on side let you put down your drinks and phone where you want them. 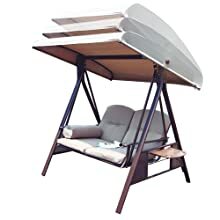 The durable and stylish Abba Patio 2 Seat Swing Glider Cover is perfect for protecting your swing glider against sun, rain, snow and dirt year round, ensuring their use for years to come. Waterproof is ideal for high moisture climates to keeps your glider new. 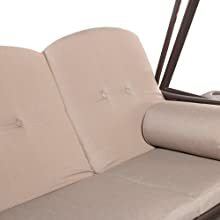 Adjustable elastic hem cord make sure the cover stays close and won't blow away in high winds.